Amid record-setting temperatures in early May, a massive wildfire began near Fort McMurray, Alberta, Canada. 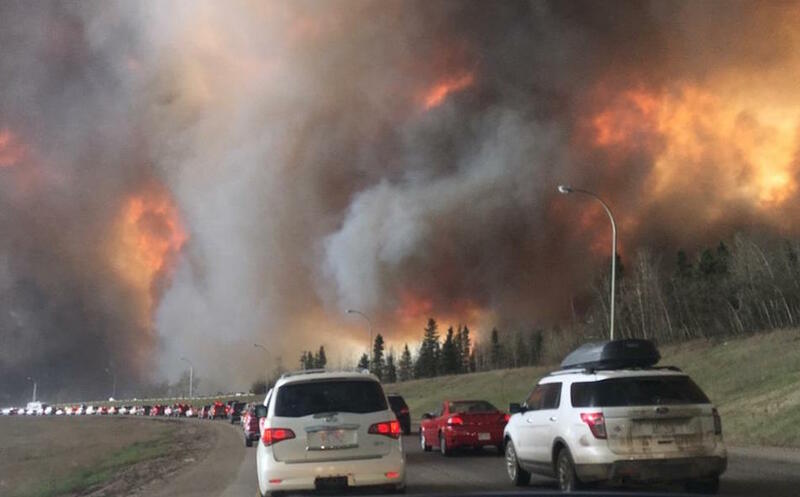 It eventually caused the biggest wildfire evacuation in Alberta’s history and reignited discussion and reporting about the role that a warming climate will play in wildfire incidence and severity. The world did it again last month – it reached another record-warm average temperature planet-wide, the National Oceanic and Atmospheric Administration and NASA announced separately this week. The two federal scientific agencies use different statistical methods. 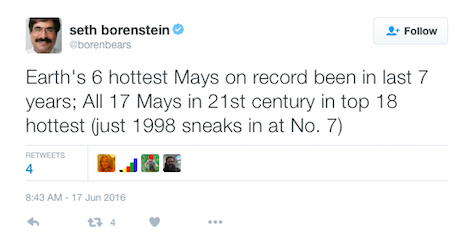 May was the 13th month in a row to set a new monthly high-temperature record – a record streak of record-warm months in the historical temperature data dating to the late 19th century. 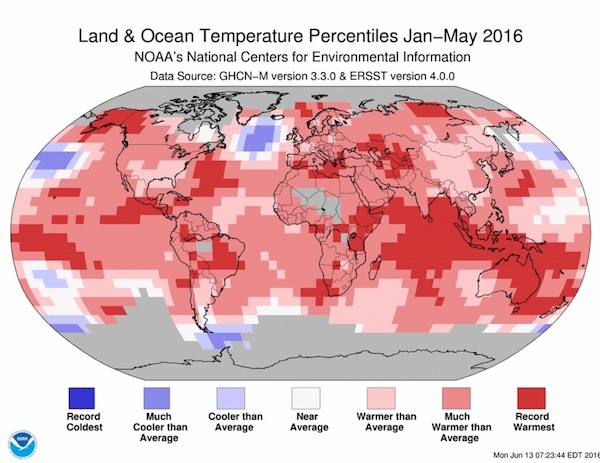 Averaged across land and ocean survaces, the global temperature was 1.57 degrees Fahrenheit above the 20th century May average of 58.6 F. It was the warmest May in the 1880-2016 record – but just barely – exceeding the previous May record, set in 2015, by 0.04 F.
It was the third-highest May average across land areas (trailing May in 2012 and 2015) – but still 2.11 F above the 20th century average for the month. 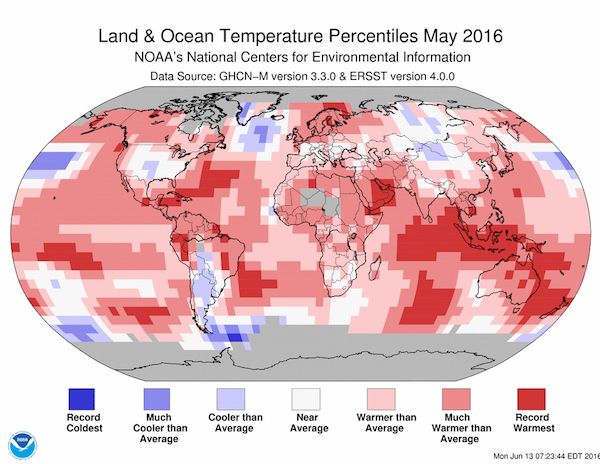 It was the highest May average across the oceans since 1880, exceeding the earlier monthly record set in 2015 by 0.09 F and topping the 20th century May average by 1.37 F.
The March-May meteorological spring period was the warmest on record for 1880-2016, exceeding the previous (2015) record average for those three months by 0.40 F. The 2016 spring average temperature 1.91 F above the 20th century average of 56.7 F.
The first five months of 2016 comprised the warmest January-May period since 1880, surpassing the previous record average, set in 2015, by 0.43 F. January-May this year was 1.94 F above the 20th century average of 55.5 F.
Associated Press science writer Seth Borenstein, a veteran journalist on the climate beat, tweeted details of the May temperature records. 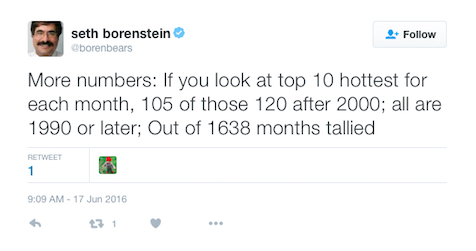 Although the recent El Niño weather pattern has ceased to boost temperatures that are being driven upward by humanity’s greenhouse pollution, climate experts say there’s an extremely high probability that 2016 will end up as the new hottest year on record, surpassing the existing record set in 2015. Extremely high temperatures are in the forecast for coming days in the the U.S. Southwest, for instance, with the National Weather Service warning about “rare, dangerous and deadly” conditions and predicting high temperatures in Phoenix approaching 120 F.
Bill Dawson, the founder and editor of Texas Climate News, is a journalist who has covered climate change since the late 1980s.